Home > Society history > Past President: 1894-1914 Robert Day, Jr.
Past President: 1894-1914 Robert Day, Jr.
Born 12 January 1836 in Cork. Married Rebecca Scott also of Cork. Robert took over the family business from his father, Robert, Sr., and also ran his wife’s family business on the death of his father-in-law, Robert Scott. Day was an active member of the Society and often displayed items from his private collection to members. He also published many papers in the Journal. It can be seen from newspapers that Day also spoke outside Cork, particularly in Ulster where perhaps he had business connections. 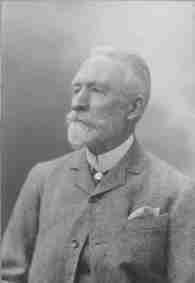 Robert Day died on 10 July 1914; his wife Rebecca died seven weeks later. For further information about his life, see Margaret Lantry ‘Robert Day: businessman and antiquarian’, JCHAS 119 (2014), 1-22.